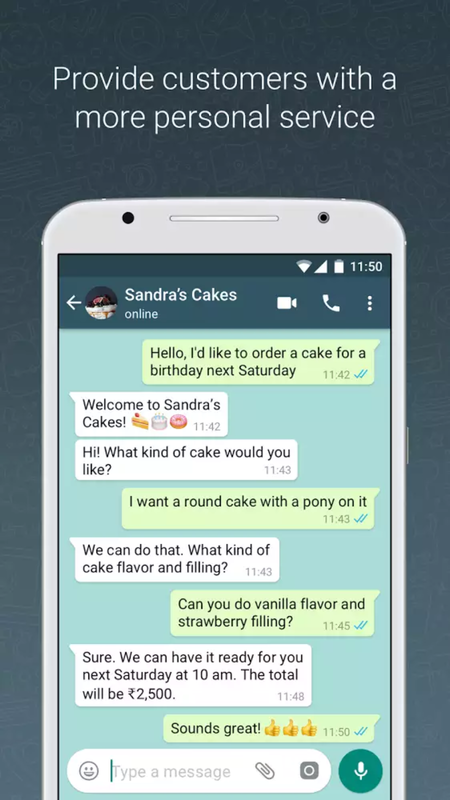 Implementation of social handles into business has started long back and now, moving ahead in the same lane, WhatsApp has introduced its business app. It was previously observed that small business owners were already using WhatsApp to connect with their existing clients through their own personal accounts. Developing more into this direction, WhatsApp has now fully fledged came up with the idea of the new app targeting small businesses. Trials were made in Indian and Brazil and at last, it has been launched successfully. Charges – There will be charges imposed in future. As of now, it is free. Profile – It looks same as we see the listing of Google maps while looking out for a nearby shop. A user will know that message they have received is from a business account. Information of timings, URL, category, short description and direction will be there in the app. Quick replies – It is basically a feature that saves your messages which are frequently used and can be used again. This way messages will be sent through one click rather than typing the whole statements. Automated messages – For instance, greet your customers by setting up a customized message for all. Insights – Application is able to produce a metrics of all the sent messages for the business to analyze and work on the next strategy. Control over the messages – WhatsApp users can block the business if they do not intend to communicate in future. As per TechCrunch, a business can only send messages to people who have provided their phone numbers and agreed to use WhatsApp. Look and Feel – WhatsApp users will know that they have been contacted by a business account. Other settings and features will remain same. Implementation – Initially in India, MakeMyTrip and BookMyShow have used the trial version of the app last September. BookMyShow has revealed another interesting feature that in any case if a user does not have an active WhatsApp account or in a bad network area, details will be sent over registered mobile via text. BookMyshow has tested this app on 25% of its user base and came out with only positive feedback. WhatsApp for business takes inspiration from other social handles like Facebook company page, Instagram business account, LinkedIn and others used to promote, aware and meet critical sales targets. Difference between them and WhatsApp business app is the audience which is using WhatsApp on a much larger scale. Every category of audience uses WhatsApp and also the time spent is more than others. Facebook also has a larger audience, however, in terms of look and feel, we think WhatsApp could be on the lucrative side. There will no other ads showing in the sidebars luring users. Only customer and user interaction are prioritized. This makes WhatsApp usability better and preferred than others. Rather than scrolling down and stumbling into different pages, it directly came to the real business and that’s what everybody needs.